BGIM Media needs your support now! When I started this space back in 2008, I had no idea how far my words would travel. Nor did I ever imagine that this space would end up being so meaningful to so many people. I still can’t believe that my words are used in classrooms and organizations across the United States to move critical and long overdue conversations on racism and white supremacy in this country. This space has allowed me to not only find my voice but use it to make a difference and it now allows others such as Samuel James, Teddy Burrage, Veronica Perez, Heather Denkmire and our other contributing writers to use their voices for change. While conversations alone will not move the needle on race relationships in the United States, they are an important and critical first step in the long journey toward dismantling white supremacy. BGIM Media’s goal is twofold. First, to serve as a space for Black people and other POC living in primarily white spaces to have a voice and to know that they are not alone by having a community online. Moving to Maine in 2002 from Chicago fundamentally shifted everything I understood about the world around race. Second, our goal is to serve as a place of education for white people and others who are looking to do their own work on race. Having now spent 16 years in Maine and five years as the executive director of Community Change Inc., I have spent a lot of time in proximity to white people and working with them on matters of race. BGIM Media often uses personal stories to discuss larger systemic issues; this style of storytelling derives from my childhood idol Studs Terkel. While this site has grown and is said to have a major impact on many, one uncomfortable truth is that I have never been able to get this site fully funded as I wrote last month in our initial plea for financial support. Last month almost 50 new patrons signed up to support this site, but we lost several this month and to be fully funded, we need 400 more people to make a minimum monthly gift of $5. Considering the number of people who are accessing our work, this is not an impossible figure but it does mean people making a conscious choice to support this work. 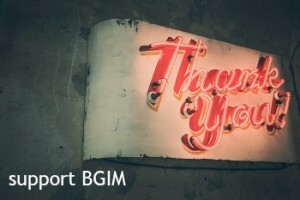 Can you make a minimum monthly gift of $5 or a larger one time gift to keep BGIM Media going? If you have spent any time online, you know that most media outfits are struggling. We have created a world where it’s easy to forget that the fabulous pieces you read are written by real people with real expenses. While our work including the podcast is all available to you for free, it is not free to produce. Given that my day job is running a small non-profit, I know that you are bombarded with almost daily requests for support. Yet if this space has added value to your life, I am asking you to let us know by making a one-time gift or monthly pledge. Theoretically, no amount is too small, though to be honest, because of money that is taken off the top before I ever see your pledges or donations or tips, anything under a buck really is too little, as I will only literally get loose change in the end. But in the end, what I am saying is that modest support—especially by enough people—is just as welcome as large donations or pledges. And perhaps more so if enough people step up with modest pledges and tips.